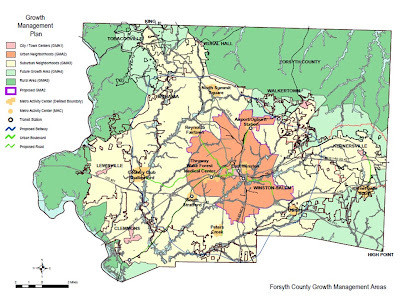 All of Growth Management Area 1 (GMA 1 -Central Business District) and part of Growth Management Area 2 (GMA 2 – Urban Neighborhoods) are included in the Downtown/Center City area. GMA 1 is defined as a dense, mixed-use area with an urban form that serves as the hub for business, government employment and culture. GMA 2 includes the area of Winston-Salem built primarily before the post-1950 pattern of auto-oriented development. Chapter 3 of this document, Growth Management, discusses development considerations and goals for each of the GMAs. For GMA 1, goals include attracting more retail and entertainment, encouraging more residential development at higher densities, increasing job space, creating retail on the first floor of buildings, developing the research park, preserving select historic resources, promoting tourism, promoting design excellence, emphasizing deck parking over surface parking, modernizing public transit and attracting a grocery store to the downtown area. Development goals for GMA 2 include promoting housing options for older residents, bringing houses up to code, attracting residential infill, directing new commercial growth to existing commercial areas, revitalizing older commercial areas, reuse/rehabilitation of older industrial structures, preserving historic resources, reducing crime, encouraging alternative transportation, modernizing public transportation, retrofitting greenways and small parks into neighborhoods and improving older parks.